The batch of Chinese artifacts was noticed by a unit of Carabinieri, or the national gendarmerie of Italy, focusing on the protection of cultural heritage, in 2007, when a television auction program was looking to sell items from a large trove of ancient Asian cultural and historical artifacts. "There was a tip that the items being offered for sale were illegally smuggled out of China," lieutenant colonel Valerio Marra, commander of the Carabinieri unit for Rome, says. "So officials were sent in to investigate and they ended up seizing 796 artifacts." Marra adds: "It's impossible to put a precise value on these items since it is never easy to put a price tag on culture and history, but I think it is safe to say that combined they would have a market value of many millions of euros." Twelve years later, those items are set to be returned to China in a repatriation that, once complete, will be the biggest transfer of cultural and historical artifacts to China since Britain returned around 3,000 items in 1998. The path between the discovery of the illegal items near the city of Monza, just outside Milan, and their presentation to Chinese officials is long and complicated. 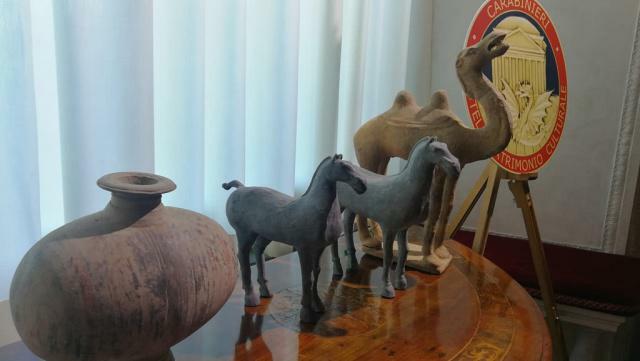 The first task facing the Carabinieri unit, according to Marra, was to determine the true provenance of the objects, especially since the would-be seller reportedly claimed they were not taken from China. A team of archeologists, art historians and other specialists determined the items were from a period spanning from the Neolithic age 5,500 years ago to the Ming Dynasty (1368-1644). After that, it fell upon Italian courts to determine what should be done with them. A judge in Milan finally ruled that they should be returned. The case represents one of the highest-level successes for the Carabinieri unit, which has around 300 investigators across the country. The division is considered a source of pride in a country known for its own cultural and historical riches spanning from ancient times to the present. "Respecting international norms for the proper treatment of these kinds of items is one of the marks of a civilized culture," Giuliano Volpe, rector at the University of Foggia and president of the Superior Council for Cultural Heritage, says. "If an object was obtained illegally, it must be returned to where it belongs." According to Marra, the Chinese artifacts originate from archeological digs and collections in four Chinese provinces: Guangdong, Qinghai, Shaanxi and Sichuan. The transfer of the items from Italy to China is expected to start this month. Once complete, China will display the items in Beijing next year as part of a wider plan to celebrate the 50th anniversary of the establishment of diplomatic ties between Italy and China.